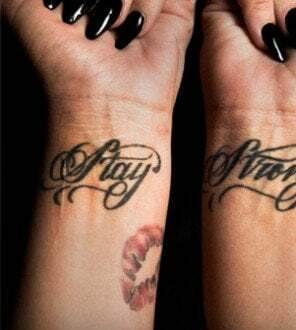 Demi Lovato’s tattoos serve as a reminder of all the obstacles she’s overcome in her life and are truly an inspiration. We’re totally obsessed, so keep ’em coming, Demi! Back when she was just 16 she got the tattoo on her right side as an important reminder to herself that she’s truly beautiful. The tattoos symbolise the obstacles she’s overcome and the inspirational words actually cover up scars she has from years spent cutting herself. A cross (on her hand). 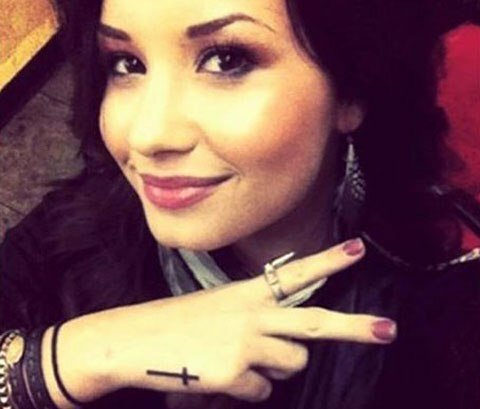 She got a small cross tattooed on her right hand in 2011 which symbolises her Christianity, and she wants all her fans to be able to see it clearly when she’s holding a microphone. In 2011 Demi and her friends Ivey Ensley, Hanna Beth Merjos and Lauren Pietra decided to get matching “kiss” tattoos inked on their bodies in different places just for fun and to represent their close friendship. Demi got the two phrases inked on the tops of her feet with “Let Go &” on the right foot and “Let God” on the left. It represents a reminder to herself that she has much love and support from God. Demi got matching “rock n’ roll” tattoos with friend Hanna Beth in 2011, embracing her “rock star” side because she’s a big fan of rock ’n roll music. 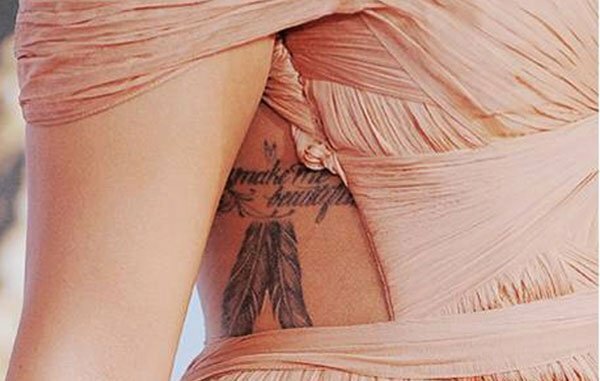 The feathers addition to her “You make me beautiful” tattoo makes it stand out more and symbolises freedom and courage. She got her peace tattoo inked about a year after she began treatment for bulimia and it symbolises her healing process. This tattoo speaks to the difficult journey she’s faced in recent years and how she made it out alive. It symbolises not only her Christian beliefs, but also her faith in herself. 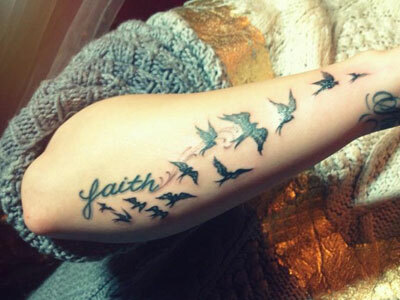 In 2012 the singer added a flock of flying birds on her right forearm surrounding her “faith” tattoo. It’s also one of the largest tattoos on her body. This tattoo takes a line from her single Warrior. In the song Demi sings about how the struggles in her personal life have made her a stronger person. 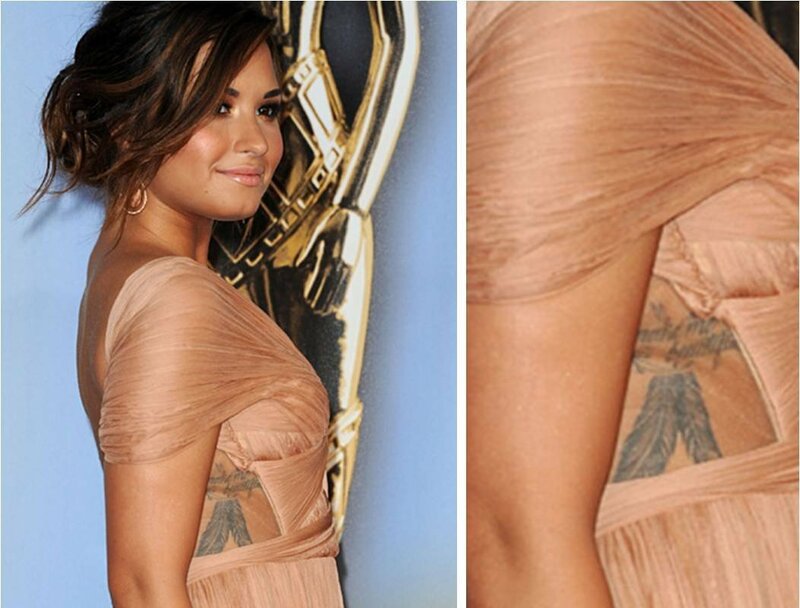 She got the tattoo in honour of her biological father, Patrick Lovato, who passed away from cancer in 2013. Three was her dad’s lucky number.